"If you need help, then look no further. 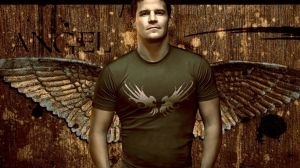 Angel Investigations is the best. Our rats are low... (What? It says "rats." Sorry.) Ahem... our rates are low, but our standards are high. When the chips are down, and you're at the end of your rope you need someone that you can count on. And that's what you'll find here -- someone that will go all the way, no matter what. So don't lose hope. Come on over to our offices and you'll see that there's still heroes in this world." 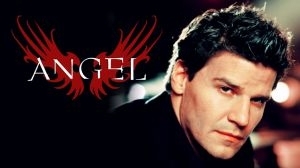 For over two centuries, Angelus was one of the most vicious vampires ever to walk the earth. Then he killed the wrong girl, and her grieving Gypsy family cursed the vampire with the return of his soul, causing him to suffer with remorse for all the hundreds of innocents that he had killed through the years. Now he goes by the name Angel, and he fights to protect the helpless from those who would prey upon them as he himself once did. Angel helps a newly turned Werewolf named Nina, who is being hunted by an exclusive club which specialises in exotic meals. A member of the club is working undercover for Wolfram & Hart under the alias, Dr. Royce. He captures Nina after promising her to the other members, but Angel and the Gang arrive to rescue her. The club are disappointed that they have no meal, so Nina bites Dr. Royce, turning him. Nina agrees to visit Wolfram & Hart once a month for a routine check-up. Spike is being tormented by the spirit of a brutal, wiccan surgeon named Pavayne. Since his magic helps him stay out of hell, he wanders around Wolfram & Hart cleaning up the loose spirits. With growing concern for Spike, Fred tries frantically to find a way to make him corporeal and prevent him from being sent to hell. While Spike battles it out with Pavayne, Fred arrives with her new contraption. As she is attacked by Pavayne, Spike is faced with a choice. He can save Fred, or he can use her machine to become corporeal. Wolfram & Hart throw a halloween party. Angel discovers the only remaining member of five ancient evil fighters working in Wolfram & Hart, while researching an aztec warrior named Tezcatcatl. We are shown this man's life through a series of flashbacks which tell the tale of 'The Luchadors', a family of Mexican wrestlers which helped the helpless until one day they were slain by Tezcatcatl. In the present day, Angel tries to help the last member discover the hero inside which he lost when his family were killed. Cyborg assassins attack the offices of Wolfram and Hart for a magical device that will give them control of Angel. Wesley is surprised by the arrival of his estranged father, who has come to evaluate Wesley for possible reacceptance to the Watcher's Council. When another mysterious package arrives at Wolfram & Hart that recorporealizes Spike, the gang learns that the existence of two living ensouled vampire heroes has created chaos in the world. After Eve tells them about a prophecy that states that the only way to restore order is to find the Cup of Perpetual Torment that bestows human life, Angel and Spike battle it out for the ultimate prize. A series of flashbacks show the history of Angel and Spike and their relationship with Drusilla. Keeping her job as Angel's assistant is the least of Harmony's worries when she wakes up with a dead vamp-bite victim in her bed and no memory of the previous night's events. And things go from bad to worse when the gang's investigation reveals that the dead guy was a demons' rights activist negotiating between two warring clans. A mysterious stranger approaches Spike claiming responsibility for recorporealizing him in a mission to guide Spike in supplanting Angel as the new vampire champion. Meanwhile, Angel is racked by intense fever dreams and hallucinations of his worst fears intensifying his worries that he will lose authority to Spike. 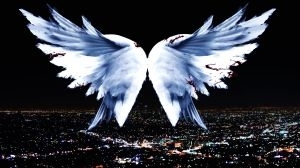 When an emotionally unstable woman, Dana, escapes from a psychiatric ward, Angel learns that she was tortured as a child and is now searching for her tormentor. Andrew, a watcher-in-training, arrives from Sunnydale with surprising information about Buffy and to inform the group that Dana is also a vampire slayer. Cordelia wakes up from her coma and is shocked and unhappy to discover that Angel and the gang are no longer fighting Wolfram & Hart, they're running it. When she realizes that Angel has lost his conviction to be a hero, she gives him the information and support he needs to get back on track. Meanwhile, while Angel has security keeping an eye on Eve, her partner Lindsay prepares to bring about Angel's demise. Angel is turned into a puppet as part of the bad guys' evil scheme to take the souls of children. When Fred opens up an ancient sarcophagus that was anonymously sent to her, she is infected by a mysterious parasitic demon called Illyria. Angel and Spike learn that Illyria is an ancient demon who existed before recorded time, and they must race to return her to an ancient demon burial ground before she kills Fred and thousands of other innocent victims. Angel and Spike return from England defeated, knowing that the ancient demon Illyria has completely taken over Fred's body and soul. Upon learning that Knox and Gunn have each contributed to her demise, Wesley is bent on revenge and Angel tries everything to restore Fred, including calling on an old friend from Sunnydale. Meanwhile, Illyria tries to locate an ancient temple where she believes she will find an army ready to help her destroy mankind. Hoping that Lindsay has information on the Senior Partners' ultimate plans, Angel, Spike and Gunn track him down in a bizarre and terrifying suburban hell. Meanwhile, a nearly invincible stranger sent by the Senior Partners, infiltrates Wolfram & Hart looking for Eve. Angel resists the appeal of parents seeking help from Wolfram & Hart regarding their son's supernatural abilities after he discovers that the boy is his son, Connor. 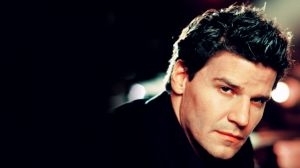 Despite his reservations, Angel is forced to bring Connor into conflict with an old adversary (Sahjahn) to prevent his son's memories from being restored. Meanwhile Wesley uncovers a mysterious deal struck by Wolfram & Hart that threatens the secret Angel desperately wants to protect. Angel and Spike travel to Rome with plans to rescue Buffy from their old nemesis The Immortal. While in Italy, they also attempt to retrieve the head of a fallen demon leader to prevent a perilous power struggle between several warring demon clans. Angel and company spend the day as if it were their last as they prepare to bring down the evil Circle of the Black Thorn. Putting their lives on the line, Spike confronts a demon cult, Lorne faces off with Lindsay, Gunn takes on an evil senator and Angel battles Hamilton, the henchman of the Senior Partners. The episode ends with Angel, Spike, Illyria, & Gunn about to fight a bunch of demons including a dragon. October 21st 2012 Rated by saldute. April 18th 2011 Rated by Da_Vinci.